Many changes to multiple shifts are able to be made in bulk. Event cancelled? Bulk delete all the shifts in one go. Using a fortnightly roster and have the perfect first week created? Bulk copy the shifts to the last week of the roster. Staff off sick? Bulk reassign all their shifts to another staff with only a few clicks. All these changes can be made using the ‘Bulk Actions’ button in the top-right corner of the roster. 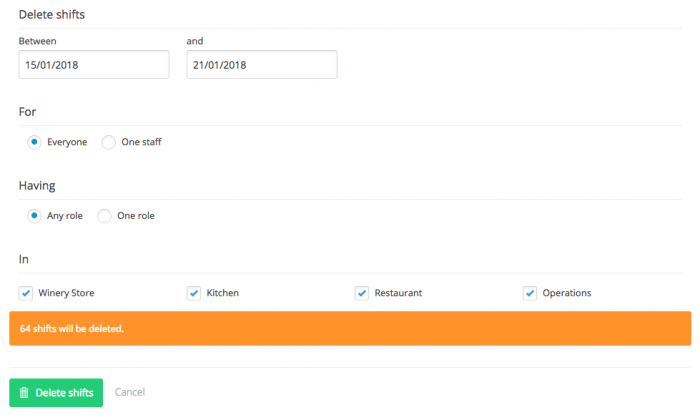 Bulk roster actions work with existing individual shifts, they will not affect shift batches. Read up here on Shift batches, another way to create and manage multiple shifts at one time. If your roster has already been published, bulk actions won’t cause notifications to be sent to staff, so it’s recommended you message staff directly to advise of changes. Any bulk actions performed will be verified, and you’ll be notified of any compliance warnings that would prevent the the changes, such as shift clashes. A pop up notification will either warn you or block making a change that is in violation of alert settings. 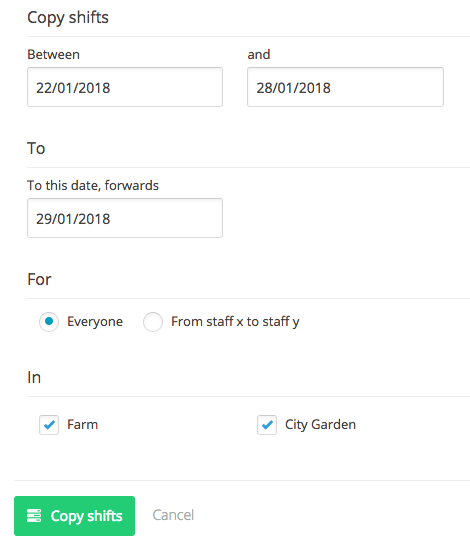 Go to the roster that the new shifts will be copied to, and start with identifying the date range of the shifts to be copied, and the start date of the range you want the shifts to be copied to – the ‘To this date, forwards’ date. If copying shifts from one staff to another the two starting dates can be the same. 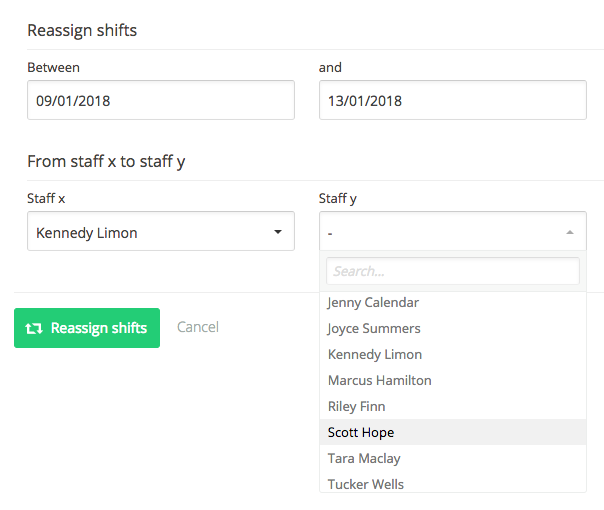 Identify the staff whose shifts you want to copy, or just select the one staff if you’re copying them so another staff can be assigned to work the same shifts. If there is more than one location on the roster you can limit to just one location, or apply the action to all. If working with a large number of shifts, or if your staff are rostered in multiple locations, then you are increasing the likelihood of coming across compliance issues. See more on this in the Compliance errors section below. Select the date or date range, and determine the staff, roles and locations it will affect, whether all of them or just a single one of each. As you vary the parameters the orange bar will advise the number of shifts that will be deleted by the action. This cannot be undone once you hit ‘Delete shifts’ so make sure you’re certain of what’s being deleted. Select the date range of the shifts to be reassigned, the staff being unassigned from the shifts, and the staff who is now being assigned the shifts. Again, any changes to be made are verified, and you’ll be notified of any compliance warnings that would prevent the the changes, such as shift clashes. More on compliance errors below. Be aware that permissions settings may prevent you from performing some of these actions. Low or critical alerts may be triggered by the proposed changes. Manager permissions control what the manager can do in instances of low or critical alerts. In some cases you may be simply warned against the action and asked if you want to continue anyway, in other instances the action may be blocked. Alert status is set in the award each staff is under. More on this in the Award settings article.